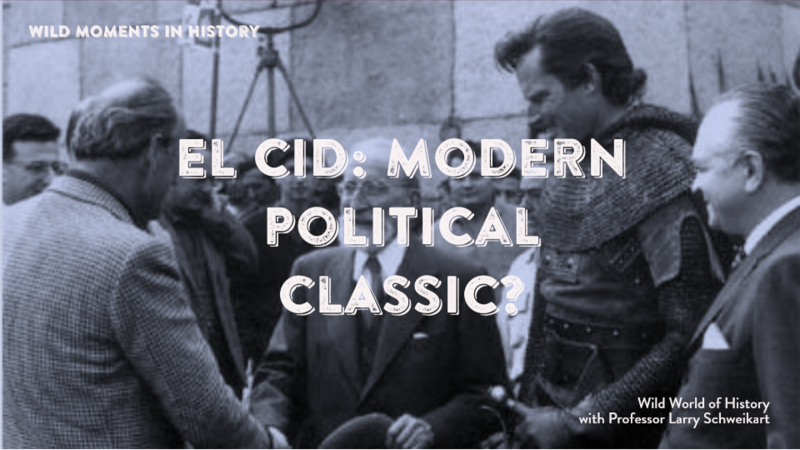 Did you know that the classic Charleton Heston movie, “El Cid,” was rife with imagery about politics of the day? The 1961 Samuel Bronston film, “El Cid,” starring Charleton Heston and Sophia Loren, was the epic story of the Spanish knight, Don Rodrigo Diaz de Vivar, whose mercy toward captured Muslim leaders cause them to pledge their allegiance to him. Castle intrigue abounds as there are three siblings to the king who has died, and Rodrigo has taken an oath to all three, and cannot fight one. He is temporarily banished, but called back when the Muslim army takes the fortress of Valencia. Rodrigo, with the help of both Spanish and Muslim allies, conquers Valencia, whereupon the crown is offered to him as El Cid (“Lord”), but he refuses. Rodrigo’s oath was to maintain the monarchy. A new Muslim army masses outside Valencia, whereupon El Cid and his allies ride out and temporarily repel them, but Rodrigo is wounded. He rides back to the castle where he dies—though this was known only to his wife and the other leaders. King Alfonso, who had banished him, now asks forgiveness. The next morning, knowing that the defenders of Valencia need to see El Cid, the leaders secure his body—flag in hand—to his horse and he “leads” the defenders out of the city to rout the invaders. Bronston, who used 7,000 extras from the Spanish army, had abundant references to Francisco Franco, who ruled Spain at the time. A general during the Spanish Civil War, Franco led the nationalists (who were backed by Adolf Hitler, Benito Mussolini, and Europe’s fascists). Most scholars have viewed Franco’s Spain as more traditional authoritarian and not fascist, and Spain was neutral in World War II. But Franco always portrayed himself as a sort of regent who was merely “holding” the government for the return of the king, who came back to power in 1975 under King Juan Carlos. Thus, in the film, “El Cid” (who refuses the crown himself, but who is “better” than the actual King Alphonso) represented Franco. Director Anthony Mann also was known to demand utter accuracy in the movie, insisting that even swords hanging on walls as set decoration be the real thing and not paper mache or wooden props. The cost of these left Bronston bankrupt, owing more than $5.6 million to Pierre S. du Pont. Although he managed a few more pictures, the bankruptcy proceedings put an end to his moviemaking. In a trial he was asked if he had a bank account in Switzerland, he said “The company had an account in Switzerland for six months.” When records surfaced showing he in fact had active accounts in Geneva, he was charged with perjury. Eventually his case, Bronston v. the United States, reached the U.S. Supreme Court, which ruled in his favor, saying that a statement that is legally truthful but technically misleading cannot be grounds for perjury. See El Cid: The Miriam Collection, Limited Collector’s Edition, 2008, for special features and commentary.